In an open letter published in Business Day FairPlay Founder Francois Baird, has called on the Government of South Africa to take urgent action on the dumping of chicken. Baird noted that Trade and Industry Minister Rob Davies and the government should learn from the way other countries deal with Brazil’s chicken dumping. South Africa is a small country compared to Brazil, the EU, US and other major chicken producers. It is of great concern that these countries use their economic might to damage our chicken industry and destroy South African jobs. The unemployed have no leverage or bargaining power. They rely on the government to protect their livelihoods and step in when global trade predators threaten their jobs. That’s what China’s government has just done, by imposing temporary antidumping measures on imports of Brazilian chicken. China’s commerce ministry found that Chinese producers had been substantially damaged by shipments of chicken from Brazil between 2013 and 2016, and moved to repair the damage by imposing deposits on importers of up to 38.4% of the value of shipments. The fact that both countries are BRICS members didn’t stop China from acting against Brazil. In SA, imports have doubled from 20% of the local market to 44% in the first quarter of 2018. SA never rocks the boat and ends up being bullied by the big boys. The EU, Brazil and others are targeting our chicken industry practices. They act quickly to exploit loopholes or regulatory delays, and they meet little resistance. South African meat importers are allowed to profit without consideration of the long-term devastating impact this has on the local industry and on the poor. Davies should take a leaf out of China’s book and step in. SA’s efficient poultry industry deserves the same consideration, and protection, to allow it sustainability and growth. 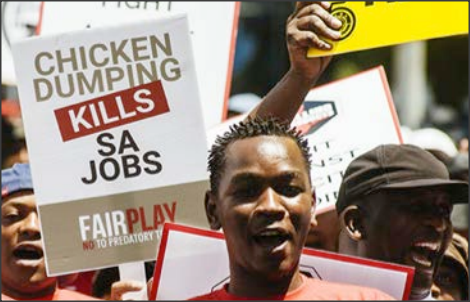 FairPlay, a trade organisation fighting dumping in the poultry and sugar industries, has expressed concerns over the tardy review of local food safety legislation and its perceived laxity, and says the department is failing to protect South African consumers. FairPlay is supported by Astral Foods, Country Bird, the Food and Allied Workers Union, KFC, RCL Foods and Unitrans. In an article published by fin24 FairPlay spokesperson Melinda Shaw said: “The outbreak of listeriosis highlighted the urgent need for packaging of all imported meat products to comply with the same regulations demanded of local products, which ensures full traceability and accountability. Last month, government amended parts of existing food safety legislation that relate to hazard analysis and critical control point (HACCP) system. The health department conceded that, “currently, there is no legislative provision for the sharing of laboratory food testing information during an outbreak”. According to Health Department spokesperson Foster Mohale: “To ensure that information requirements during an outbreak can be provided with urgency, regulatory review and inclusion of a provision is needed to address confidentiality issues,” Mohale said. When asked why the department denied that not all legislation reviews were due to an outbreak, Mohale said: “Legislation is dynamic and must be based on science. A long time frame for developing, reviewing and completing legislation is not unusual as it is a highly consultative process as required by the Constitution.” He added that work on the review of the food safety legislation was prioritised in line with available resources. The issue of the impact of EU sales of poultry parts at prices which in no way reflect EU poultry production costs is a common problem across Africa Poultry producers and trade unions in South Africa and Ghana have joined the FairPlay anti-dumping movement in opposing dumping of EU poultry parts on African markets. In West Africa, the EU poultry trade is seen as fuelling migration pressures. Speaking before the UN General Assembly Ghana’s President made an explicit link between expanding EU sales of poultry parts and migration, arguing ‘Ghanaians who embark on the risky journey to Europe are poultry farmers or entrepreneurs who “sell their shops and undertake the journey because they can no longer compete with the tonnes of frozen chicken dumped on African markets annually” Given the scale of EU exports to 38 sub-Saharan African countries, this is a pan-African issue. Without concerted African action which mobilizes public opinion in Europe to regulate the EU’s developmentally disruptive poultry trade practices, sub Saharan African poultry and poultry feed producers are likely to face a grim future, with growing African consumer demand for poultry meat increasingly being met from imports rather than expanding domestic African poultry production. This would be unfortunate given the strong linkages African poultry producers can develop to domestic grain and oilseed producers. These linkages can generate transformative income earning opportunities in rural areas, with the loss of these linkages being a major developmental concern. South Africa’s Value Added Tax (VAT) regime includes 19 basic foodstuffs that are zero-rated to help limit the impact of VAT on poor households. Given how much society and consumption patterns have changed over the past 25 years, a complete review of the basket is urgently needed. The concept of zero-rating certain foods seems sound, evidenced by a 2015 World Bank study into the distributional impact of fiscal policy in South Africa. It concluded, among others, that VAT was a progressive mechanism partly due to the zero-rating of basic food items. The 2018 budget increased the national VAT rate for the first time in 25 years. Following a public outcry, National Treasury appointed an independent panel to review the existing zero-rated basket. FairPlay believes that the review of the zero-rated items is an opportunity to do much more than only mitigate the VAT impact on low-income households. By taking a broader view, the zero-rated items can also achieve economic growth objectives. By including locally produced chicken, the primary source of protein for South Africans, not only will it improve nutrition for poorer families. But also importantly it will help to facilitate industry transformation and boost employment. This is what the FairPlay campaign wants to achieve – immediate relief for members of our society who need it most, through mechanisms that will firstly safeguard and secondly grow a strategically important sector of the economy. South African chicken is arguably the only commodity that can achieve this dual objective. Dumping is defined in the Agreement on Implementation of Article VI of the GATT 1994 (The Anti-Dumping Agreement) as the introduction of a product into the commerce of another country at less than its normal value. Going even further the European Commission elaborates “Since December 2017 the EU has an alternative method to calculate dumped imports if state interference significantly distorts the economy of the exporting country”. No other trading partner in the world can provide a more glaring example of state interference than the EU with its trade distorting agricultural support payments that by the EU Commission’s own admission accounts for 46 percent of farm income in the EU. According to data from the EU market access database and published in a paper by Paul Goodison the landed price of frozen cuts from the EU is €0.90 per kilogram. Additionally according to a study done by Waginengen University, Europe’s foremost agricultural university production costs in the EU are €1.52 per kilogram. This is higher than production costs in other poultry producing countries but EU state interference through its subsidy programmes and trade barriers prevents import competition to ensure profitability. By any definition chicken dumping by the EU is an open and shut case. South Africa for stretching the truth on food safety tests for imported chicken and other meats On behalf of importers, he implies that all foreign abattoirs are inspected and that every imported consignment is tested by our health authorities. Readers are left to believe that no contaminated meat would ever be imported, and if it did happen, it would never reach our shops and consumers. Wolpert and his fellow importers took them to court. Instead of defending an underfunded and therefore inefficient testing regime, Wolpert should be fighting for greater safety for our consumers. He should be fighting for importers to be subjected to the same rules as local producers. For local production there is farm testing, plant testing (both environmental and product) and shelf testing. There is a record of all testing. In the event of contamination, health authorities can trace a product back to the farm, and sometimes to the chicken house it came from. Imported product can be sold here as potentially coming from nine countries on three continents, making traceability difficult, if not impossible. In addition to deficiencies in labelling requirements for imported product, there are very worrying health risks in thawing and repackaging of frozen bulk imports. Everything is not fine, Mr Wolpert, and consumers would be safer if you would admit it. The FairPlay Movement is a not-for-profit trade movement that fights for jobs. Its goal is to end predatory trade practices between countries so that big and small nations play by the same rules. It supports the principle that penalties for transgressing those rules apply equally to everybody. FairPlay was founded in October 2016. In alliance with existing organisations and experts it formulates and promotes strategies to defend communities made vulnerable by predatory trade practices and promote sustainable livelihoods. These alliance partners are international, currently from the USA, Canada, UK, Ghana and South Africa. FairPlay mission: To end the scourge of dumping as an immoral trade practice. FairPlay vision: A world where dumping no longer exists, with free trade according to the rules.